Ingham is approximately 110 kilometres (68 mi) north of Townsville and 1,437 kilometres (893 mi) north of the state capital, Brisbane. The town is positioned about 17 km inland within the Herbert River floodplain where Palm Creek drains the low-lying lands. It is surrounded by sugar cane farms which are serviced by a number of private railways. The North Coast railway line passes through the town, which is served by the Ingham railway station. The Bruce Highway also passes through the town. Prior to European settlement, the Ingham area was inhabited by the Warakamai People. The town was founded in 1864. It was gazetted as the local government area Hinchinbrook Division in 1879, becoming the Shire of Hinchinbrook in 1903. The town is named after William Bairstow Ingham, a pioneer sugar planter on the Herbert River in 1874. Lower Herbert Post Office opened on 1 January 1871 and was renamed Ingham in 1882. A gaol opened in July 1886; previously there had only been a police lock-up. The town has a strong Italian and Spanish history with the 1920s and 1930s seeing a large influx of immigrants from these countries. The Black Hand Gang, made up of some of these immigrants, terrorised the town in the 1930s with bribery and corruption forming a dark chapter in the towns history. Ingham State High School opened on 2 February 1952. Ingham State School opened on 4 May 1855 and celebrated its Golden Jubilee in December 1935. The current Hinchinbrook Shire Library opened in 2011 in Ingham. At the 2011 Australian Census the town recorded a population of 4,706. In March 2018, flood waters inundated properties in Ingham following heavy rain. Ingham is the service centre for many sugarcane plantations, which are serviced by the two sugar mills located in the Ingham district: (located approximately 6 km from Ingham), which is the largest sugar mill in Australia and one of the largest in the southern hemisphere, and Macknade Mill, which is the oldest operating sugar mill in Queensland. Both mills are owned and operated by Wilmar Sugar Australia Limited. The majority of the cane is transported to the mills by light tramlines. Once processed by the mills, the raw sugar is then transported by tramline to the bulk sugar terminal at the nearby seaside port of Lucinda and loaded onto ships for export via the longest pier in the southern hemisphere (4.75 km long). Other industries in the Ingham area include cattle, watermelons, rice, horticulture, fishing, timber and tourism. The town is home to the regional art gallery called TYTO Regional Art Gallery which sits alongside the TYTO Wetlands and Enrico's Restaurant. In the same precinct is the Hinchinbrook Shire Library located at 73-75 McIllwraith Street. Wallaman Falls are about 40 km to the west of the town. Hinchinbrook Island is about 20 km north of Ingham. The Australian-Italian Festival is held in Ingham the first weekend in August each year and is one of the most popular events in the region, with thousands of people attending the event. The festival celebrates Ingham's cultural background, dating from the 1890s, when the first Italian immigrants came to the region. More than half the population of the town are of Italian descent. The town is known as "Little Italy". The annual festival, held at TYTO Wetlands, began as an idea from a community workshop. Many Italians visit from Italy to celebrate the event, reinforcing the cultural ties between the inhabitants of Ingham and Italy. Ingham has a tropical monsoon climate (Köppen climate classification Am). Like the rest of Far North Queensland, it has a very humid and hot wet season that runs from November to April and a less humid and warm dry season that runs from May to October. Ingham is part of the Queensland Wet Tropics bioregion. The Herbert River Express is a newspaper published in Ingham since 1904. Following the devastation caused by cyclone Yasi in Far North Queensland in February 2011, Ingham is one of a number of towns where a cyclone shelter was built. The Ingham cyclone shelter is capable of withstanding winds of more than 300 kilometres (190 mi) per hour, as experienced in a category five cyclone. The building serves as a multi-purpose sports facility for the Ingham State High School while in a cyclone it provides shelter for up to 800 people. The shelter was opened by Premier Campbell Newman in January 2013. ^ Australian Bureau of Statistics (27 June 2017). "Ingham (Urban Centre/Locality)". 2016 Census QuickStats. Retrieved 23 January 2018. ^ a b "Ingham - town (entry 16673)". Queensland Place Names. Queensland Government. Retrieved 15 August 2016. ^ a b "Ingham - locality (entry 49502)". Queensland Place Names. Queensland Government. Retrieved 15 August 2016. ^ "Queensland Globe". State of Queensland. Retrieved 15 August 2016. ^ "Warakamai People". AusAnthrop Australian Aboriginal tribal database. Archived from the original on 4 December 2014. Retrieved 1 December 2014. ^ "OFFICIAL NOTIFICATIONS". The Brisbane Courier. XLII, (8, 895). Queensland, Australia. 19 July 1886. p. 6. Retrieved 9 October 2017 – via National Library of Australia. ^ Henderson, Lyn (1978). "ITALIANS IN THE HINCHINBROOK SHIRE, 1921-1939: MOTIVES FOR MIGRATION" (PDF). espace.library.uq.edu.au/view/UQ:207962. Archived from the original (PDF) on 9 January 2018. Retrieved 9 January 2018. ^ "Queensland Heritage Register Migration Places" (PDF). Queensland Government. Archived (PDF) from the original on 9 January 2018. Retrieved 9 January 2018. ^ "Unravelling an enigma: In search of the truth of North Queensland's Black Hand". Radio National. 9 May 2016. Archived from the original on 15 October 2017. Retrieved 9 January 2018. ^ "The Black Hand Gang: part two". Radio National. 21 April 2016. Archived from the original on 11 May 2016. Retrieved 9 January 2018. ^ "INGHAM STATE SCHOOL". Townsville Daily Bulletin. LVII, (351). Queensland, Australia. 7 December 1935. p. 7. Retrieved 3 February 2018 – via National Library of Australia. ^ "Public Libraries Statistical Bulletin 2016-17" (PDF). Public Libraries Connect. State Library Queensland. November 2017. Archived (PDF) from the original on 30 January 2018. Retrieved 31 January 2018. ^ Australian Bureau of Statistics (31 October 2012). 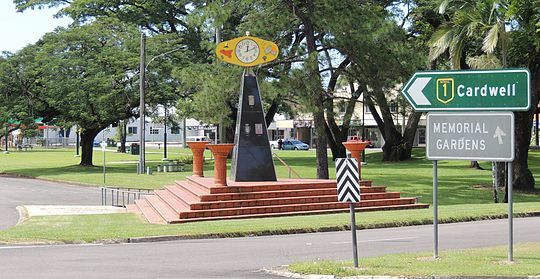 "Ingham (Urban Centre/Locality)". 2011 Census QuickStats. Retrieved 17 August 2014. ^ "North Queensland flood: More than 200 homes inundated as Ingham flood peaks". ABC News. 10 March 2018. Archived from the original on 11 March 2018. Retrieved 11 March 2018. ^ "Hinchinbrook Library". State Library of Queensland. Archived from the original on 10 January 2018. Retrieved 9 January 2018. ^ a b Australian Italian Festival Ingham Archived 23 March 2008 at the Wayback Machine. Retrieved on 17 May 2012. ^ "Imgham". Tourism and Events Queenslan. Queensland Government. Archived from the original on 17 September 2016. Retrieved 15 August 2016. ^ "Gairloch Bridge (entry 602591)". Queensland Heritage Register. Queensland Heritage Council. Retrieved 9 July 2013. ^ "Ingham Post Office (Place ID 106200)". Australian Heritage Database. Department of the Environment. Retrieved 1 October 2018. ^ "5 Lynch Street (entry 602193)". Queensland Heritage Register. Queensland Heritage Council. Retrieved 9 July 2013. ^ "Ingham Court House (entry 601546)". Queensland Heritage Register. Queensland Heritage Council. Retrieved 9 July 2013. ^ "Tina Arena". Walter Mason. Archived from the original on 2 August 2014. Retrieved 15 September 2014. ^ "Climate statistics for Ingham". Australian Bureau of Meteorology. Archived from the original on 17 February 2013. Retrieved 1 January 2010. ^ "Historical Notes on North Queensland Newspapers". James Cook University. Archived from the original on 9 November 2017. Retrieved 10 November 2017. ^ "Herbert River Express". News Corp. Archived from the original on 9 November 2017. Retrieved 10 November 2017. ^ "World class cyclone shelter for Ingham". Department of the Premier and Cabinet. Queensland Government. 16 January 2013. Archived from the original on 13 April 2014. Retrieved 11 April 2014.